Two Colorado breweries have already taken steps to make the 25th anniversary celebration of the Great American Beer Festival a bit more special. Perhaps there’ll be news of more in coming weeks. 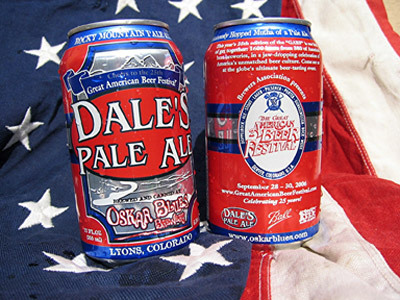 You can already find special cans of Dale’s Pale Ale in many of the 13 states that Oskar Blues (in Lyons, just up the road from Boulder) sells its beer. The cans feature the GABF logo and information on the festival, scheduled for Sept. 28-30 in Denver. The Brewers Association and Boulder Beer teamed up to produce a beer commemorating the 25th GABF. Boulder Beer also brewed a special high gravity ale to celebrate the inaugural GABF in 1982. Boulder Beer was one of the original 22 breweries at the first GABF and has been a participant every year since. Boulder will roll out its “GABF 25th Year Beer” in 11 states in early September – and, of course it will be available at the festival. it will first be served at Boulder Beer’s 27th anniversary party, The Goatshed Revival, Aug. 26 from 1 – 8 p.m. The Goatshed Revival is an annual outdoor celebration with proceeds benefiting the local Habitat for Humanity.